In spite of its rather utilitarian name the GR34 walking path in Brittany has some of the most beautiful coastal scenery and breathtaking views that you can imagine! The route stretches 1800km around the entire Brittany coastline from Vitre in Ille-et-Vilaine to Tour-du-Parc in Morbihan. It’s a wonderful challenge for experienced walkers or great fun to dip into on family excursions during your Brittany holiday. The history of the GR34 stretches back to the 17th Century when it was used by coastguards, and known as the ‘Sentier des Dourniers’ or Customs Trail; the clifftop path offered an ideal view of the bays and beaches below where smugglers would launch ships carrying tea, wine, spirits and tobacco bound for England whilst avoiding expensive import duties. It wasn’t until the 1960s that the GR34 became a recognised walking route with markers to guide hikers along the way, since then it has grown in popularity and is now one of the favourite destinations in France for hikers. The incredible scenery from the clifftop vantage point is surely the main reason the GR34 is so well loved. The route includes many famous sights including the magical bay of Mont Saint Michel with its tidal island monastery, the azure sea and golden beaches of the Emerald Coast, The Pink Granite coast with its unique rock formations, the Morbihan Gulf full of islands, the wild and beautiful Crozon Peninsula and so much more! If you are a keen artist or photographer you won’t want to miss the chance to capture some of the spectacular views you’ll encounter! Even if you only visit a short stretch of the route the changing light at dawn and dusk or fluctuations in the weather will mean that you can experience so many versions of the seascape – even the most reluctant artist is sure to be inspired. As you’d expect in a coastal setting there is a wide variety of bird life to see on the GR34 path. Keen spotters should bring their binoculars to clock up sightings of seabirds including puffins, guillemots, spoonbills, terns, razorbills and even ibis. The diverse landscape along the route includes cliffs, beaches, saltmarshes and dunes providing habitats for a huge number of species. Much of the route is unspoilt, rural and remote, the Crozon Peninsula even has protected status as part of the Armorique Natural Park so the flora and fauna can flourish unhindered. Much of the GR34 path is easy going – not too steep and with a good standard of pathway underfoot, however you should keep in mind that the path does run close to the cliff edges in places and is very exposed in windy and wet weather so plan your trip carefully! The route is signed and marked but a good map will help you keep track of your progress. Another thing to remember is that there are not always chances to stock up on food and drinks without making detours to towns and villages near the route. Plan your stops and make sure you bring enough supplies to see you through comfortably – it’s especially important to bring plenty of water if you are walking on a hot summers day. 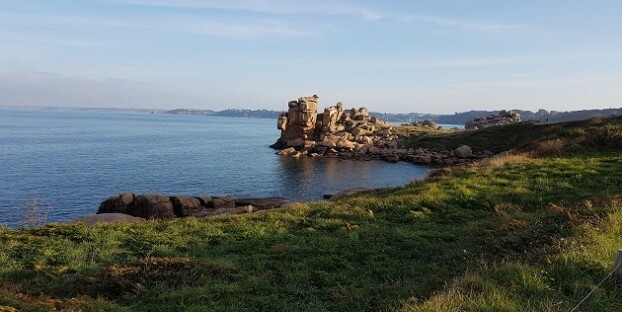 The section of the route between Perros-Guirec and Ploumanac’h is ideal for seeing the spectacular rock formations of the pink granite coast. The walk will only take an hour or so leaving plenty of time to explore the huge standing stones and boulders on the sandy beaches below at closer quarters, and have a delicious lunch in one of the many cafes and restaurants at Perros-Guirec. Get a unique view of one of the best-loved monuments in France; the magical monastery on a tidal island that is Mont Saint Michel. The GR34 section from Cancale to Mont Saint Michel is about 40km long, ideal for a weekend of walking. Leave time to tour Mont Saint Michel and to taste the delicious local oysters that Cancale is famous for. If you’re keen to see the dramatic coastline of the Crozon Peninsula this is the route for you! Do a circuit out around the Cap de la Chevre and on to Morgat beach to discover rocky coves, stunning blue-green waters and the island lighthouse on Ile Vierge warning ships of the treacherous surrounding waters – it’s the tallest lighthouse in Europe! The route from Benodet to Pont-Aven takes in the historic fishing port town of Concarneau. The beautiful coastal scenery here inspired famous artists like Gauguin and you’ll discover fishing ports, sand dunes, hidden coves, islands and cliffs on this lovely 33km stretch of the GR34 – perfect for a weekend of walking. Choose from our portfolio of gorgeous Brittany cottages and B&Bs and plan your Brittany adventures with us to get 20% off your Brittany Ferries crossings!